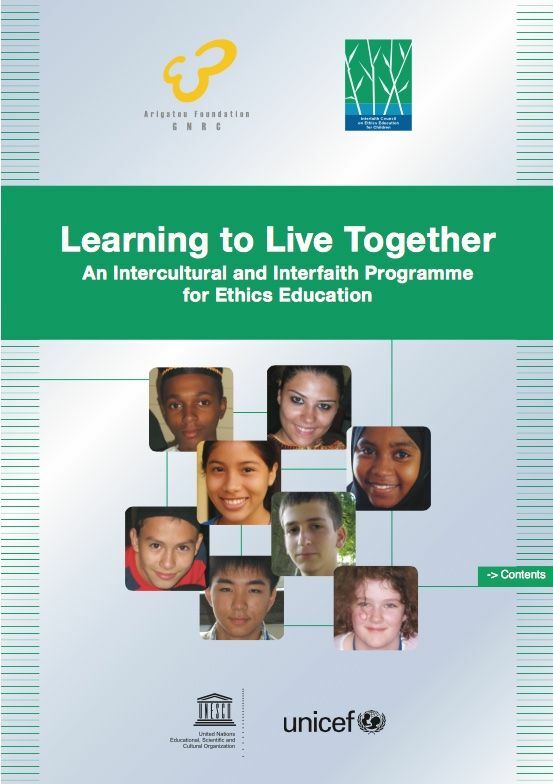 Learning to Live Together is an interfaith and intercultural programme for Ethics Education that contributes to nurturing ethical values in children and young people. The programme was developed by the Interfaith Council on Ethics Education for Children in close collaboration with UNESCO and UNICEF and tested through the Global Network of Religions for Children to contribute to the realization of the Right of the Child to full and healthy physical, mental, spiritual, moral and social development, and to education as set out in the United Nations Convention on the Rights of the Child (CRC), in article 26.1 of the Universal Declaration of Human Rights (UDHR), in the World Declaration on Education for all and in the Millennium Development Goals. Learning to Live Together is a programme for educators (teachers, youth leaders, social workers) to nurture ethical values and spirituality in children and youth that will help them strengthen their identity and critical thinking, ability to make well grounded decisions, respect and work with people of other cultures and religions, and foster their individual and collective responsibilities in a global community. Learning to Live Together is built in two modules, â€œUnderstanding Self and Othersâ€ and â€œTransforming the World togetherâ€. It is based on four ethical values: respect, empathy, responsibility and reconciliation. The learning process focuses on methodologies based on experience, cooperation, problem solving, discussions and introspection.